ItemG-04255 - The Clayoquot lifeboat at Tofino. ItemG-03552 - "GTP SS Prince George in dry dock - Prince Rupert, BC"; the Prince George was built in 1910, and sold by Grand Trunk Pacific to Canadian National Railway before the first world war. Item G-03552 - "GTP SS Prince George in dry dock - Prince Rupert, BC"; the Prince George was built in 1910, and sold by Grand Trunk Pacific to Canadian National Railway before the first world war. 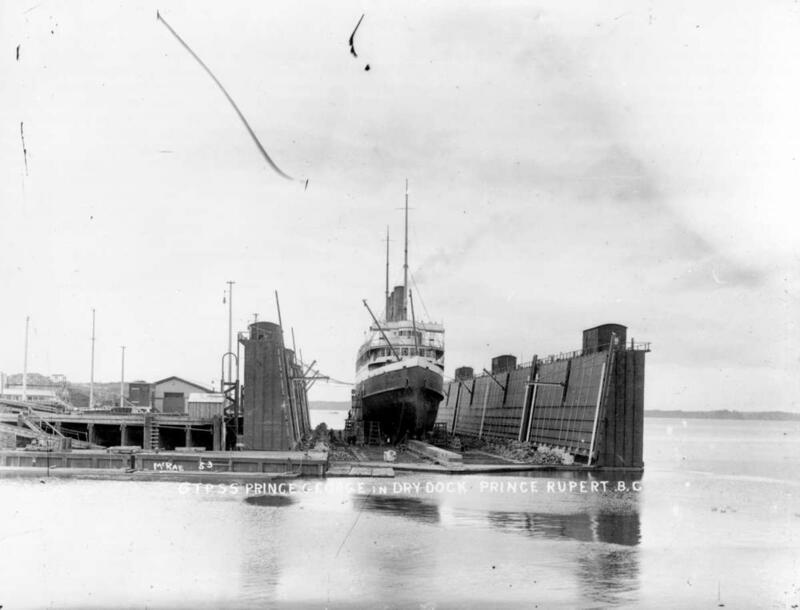 "GTP SS Prince George in dry dock - Prince Rupert, BC"; the Prince George was built in 1910, and sold by Grand Trunk Pacific to Canadian National Railway before the first world war. Restriction: image HP00923 is a glass plate negative. Researchers should consult the online reference image or reference room copy prior to consulting the original.